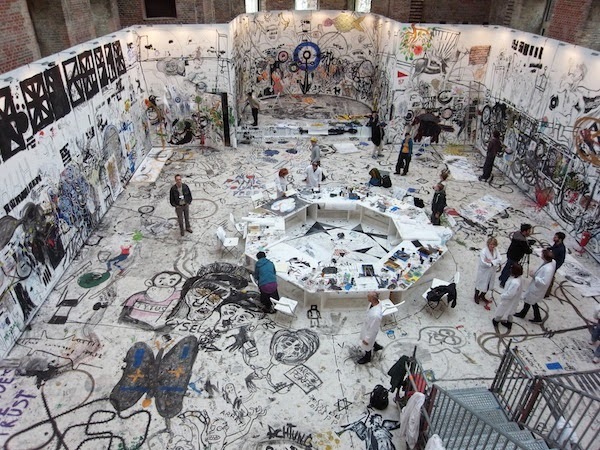 Friday April 18th from 5:00 to 6:00 PM we will be participating in the exhibition by the polish artist Pawel Althamer. The eshibition is a collaborative project entitled the "Draftsmen's Congress". The project involves the making of one large collaborative drawing that will take up the entire fourth floor space of the museum. All NYC Urban Sketchers are invited. Arrival: When you arrive to the museum you should enter through our main entrance, go to the front desk and announce your arrival. They will know you are coming. All coats/bags should be checked in at the coat check. You will receive entrance tickets and you need to hold on to this ticket in order to exit the 4th floor and come back up again should you wish to do that at any point. In order to go up to the 4th floor the whole group needs to be present and so you need to be sure that the whole group arrives at the same time. You cannot bring any food or drinks up to the 4th floor. Materials: There will be a great range of materials available to work with and these include: acrylic paint (range of colors), gouache, watercolor, charcoal, charcoal pencils, crayons, oil pastels, colored pencils, chalk, chalk pastels, many kinds of pens and markers. Furthermore we will have a range of brushes and rolls available to work with and a range of different kind and sizes of paper to work on around the large table in the middle of the space. There will be painters coats and suits and shoe covers to wear if needed. You are welcome to bring your own materials but we do not allow any spray cans or other types of cans or any oil based paint. A few guidelines: We hope that everybody will really enjoy taking part in the project and be mindful of each other in the space as there will always be more people working at the same time. We ask that all materials be returned to our facilitators after use and that you do not take any of these with you when you leave the space. We ask that you only draw and paint on the 4th floor and not on any other floor of the Museum, the Draftsmen’s Congress is only on the 4th floor. At 6pm all are asked to leave the space.